MMC is a mesh-based Monte Carlo (MC) photon simulation software. It can utilize a tetrahedral mesh to model a complex anatomical structure, thus, has been shown to be more accurate and computationally efficient than the conventional MC codes. 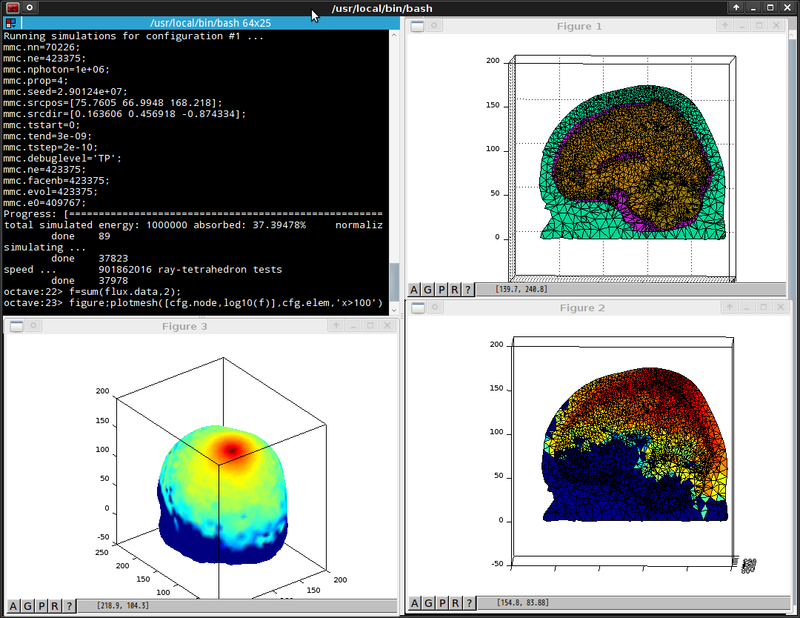 MMCLAB is the native MEX version of MMC for MATLAB and GNU Octave. By converting the input and output files into convenient in-memory variables, MMCLAB is very intuitive to use and straightforward to be integrated with mesh generation and post-simulation analyses. Because MMCLAB contains the same computational codes for multi-threading photon simulation as in a MMC binary, running MMCLAB inside MATLAB is expected to give similar speed as running a standalone MMC binary. If your CPU supports, running mmclab with the 'sse' option can be 25% faster than the standard mode. Installation of MMCLAB is straightforward. You first download the MMCLAB package and unzip it to a folder; then you add the folder path into MATLAB's search path list. This can be done with the "addpath" command in a working session; if you want to add this path permanently, use the "pathtool" command, or edit your startup.m (~/.octaverc for Octave). 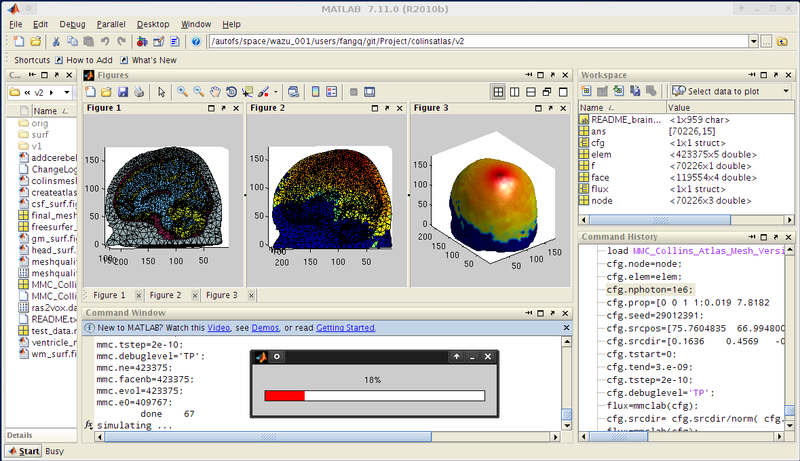 After installation, please type "help mmclab" in MATLAB/Octave to print the help information. and enter in MATLAB/Octave to see the help information regarding how to use this function. The help information is listed below. You can find the input/output formats and examples. The input cfg structure has very similar field names as the verbose command line options in MMC. a set of parameters for a simulation. *cfg.prop:        an N by 4 array, each row specifies [mua, mus, g, n] in order. typically [0 0 1 1]. The second row is type 1, and so on. and srcpattern is a pattern array, valued between [0-1]. distribution, rather than a sine distribution. if type='prep' with a single output, mmclab returns ncfg only. flux: a struct array, with a length equals to that of cfg. or [size(cfg.elem,1) total-time-gates] if cfg.basisorder=0. depending on cfg.outputtype) at each mesh node and time-gate. detphoton: (optional) a struct array, with a length equals to that of cfg. to convert them to mm unit. used as the input to avoid repetitive preprocessing. of seed equals that of detphoton. In this example, we show the most basic usage of MMCLAB. This includes how to define the input configuration structure, launch MMC simulations and plot the output data. In this example, we validate MMCLAB with a homogeneous medium in a cubic domain. This is the same as in mmc/examples/validation; the details of the simulation is described in Fig.2 of [Fang2010]. In this example, we validate the MMCLAB solver with a heterogeneous domain and the analytical solution from the diffusion model. The domain is consisted of a 6x6x6 cm box with a 2cm diameter sphere embedded at the center. This test is identical to the simulations under mmc/examples/meshtest, which are described by Fig. 3 in [Fang2010]. In this example, we demonstrate how to use the debug flags to print photon trajectories. The domain is a simple 10x10x10mm cube. This test is similar to the simulations under mmc/examples/onecube. In this example, we run MMC using a homogeneous cubic domain, same as in demo_example_validation.m. We save the seeds of the detected photons, and then rerun these photons again (i.e. the "replay" part). This feature allows one to identify features that are only related to a source/detector pair. In this example, we compare MMC and MCX using both simple and widefield sources. In this example, we simulate an spatial-frequency domain imaging source using a 2-layer brain model. The command mkoctfile must be accessible from your command line and it is provided in a package named "octave3.x-headers" in Ubuntu (3.x can be 3.2 or 3.4 etc).